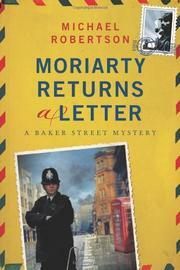 More trouble for the Sherlock Holmes letters and the curators who love them not wisely but too well. A century and more ago, a brave undercover Pinkerton operative pretended to be professor Moriarty in a last-ditch attempt to prevent crime lord extraordinaire Redgil from executing him. Fifty years later, the operative’s son, Capt. James Moriarty of the U.S. Army, lost his life when a London pub was bombed. Now, in 1998, the nuptials of actress Laura Rankin and Reggie Heath, Q.C., whose sideline is answering the letters still addressed to Sherlock Holmes, are complicated—well, virtually trashed—by the miraculous escape from death of schizophrenic savant Darla Rennie from the mangled car in which she’d kidnapped Laura and by a new exhibit of Holmes letters quickly installed and then even more quickly pulled from Dorset House—but not in time to prevent a new malefactor from noticing evidence of a sinister secret that must be protected at all costs from Reggie and his brother Nigel, a blandly inoffensive solicitor who was once in group therapy with Darla. The two brothers, surely the most reluctant detective duo in fiction, wend their way through a thicket of false identities, hairsbreadth escapes, Sherlock-ian references and Wodehouse-ian dialogue to end with the tableau of two mortal enemies locked in hand-to-hand combat hurtling over a cliff. Hmm. Robertson (The Baker Street Translation, 2013, etc.) extracts another ebullient puzzle from the most improbable yet thoroughly logical sources imaginable.